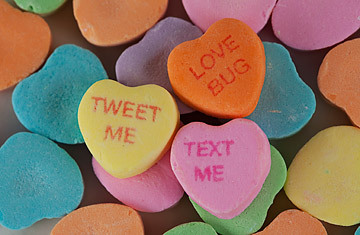 How Do They Get Those Tiny Words on Sweethearts Candy? This Valentine's Day, TIME took a break from prank-calling our ex-boyfriends and stuffing our tear-stained faces with chocolates to ponder the origins of the Sweetheart, the heart-shaped conversation candy that has been helping people woo their valentines for over a century. The New England Confectionery Company (Necco) still produces the sugary treat in much the same way that it did when it first started at the beginning of the 20th century. Necco marketing director Aimee Scott talks to TIME about how the candy is made and shares the weirdest sayings that have ever been suggested for Sweethearts. Have Sweethearts really been around for 109 years? Oh, yes. Necco founder  well, back then, it was called Chase and Co.  Oliver Chase created the machine to print things onto candy. The original candy was called a colloquial. It was a little shell with a paper in it, sort of like a fortune cookie. Oliver's brother Daniel Chase came up with the idea for the Sweetheart. We've been making Sweethearts since 1902. How many hearts do you sell over Valentine's Day each year? We pump out 10 million to 14 million lb. of hearts a year. [That's about 4.8 billion to 6.7 billion hearts.] We make hearts 11 months out of the year, but we sell almost all of them in a small six-week window. They basically get put on the shelf in January, and after Feb. 14, they're irrelevant. How many letters can you fit on a heart? Five letters on the top line. Four on the shorter line. The W is a longer letter, though, so if we use the W we do lines of four and three. How do you make a Sweetheart? We use the same process that we always have. We mix all the ingredients to make the dough. Then we have people who take the dough and throw it on this machine that stretches it and rolls it. Sweethearts are not embossed or laser printed. They're made with an old-fashioned print plate with letters that we can move around on it. We use red ink. After the letters get printed, then the dough gets cut into a heart. Then it takes two to three days for the hearts to dry. They're not baked. We have rooms here with racks and racks of hearts drying. They get put into what we call the rocket launcher that jumbles them together so that any one box doesn't have hearts of all one color. How many different Sweetheart sayings are there? We have about 80 different sayings each year. We try to have about 20 new sayings, and then we keep about 30 to 35 of the older ones like "Be Mine." The rest are a mix of ones from previous years or phrases that are popular enough that we need more of them. What are the new Sweetheart phrases this year? The last theme we had was technology, so we did "Tweet Me" and "Text Me." This year, our theme is "Get Moving." It's all about actions. So we have stuff like "Boogie," "Shake It," "Hold Hands," "U Move Me." Last year you asked people to send in suggestions for things to write on Sweethearts. How did that go? We got over 10,000 submissions. The top 10, we ended up using. They were "You Rock" and "Puppy Love" and stuff like that. But we also got a lot of weird ones, like "Love Bacon." "Justin Bieber." Someone suggested "The Situation." "Beef Burrito." People would suggest individualized things like "You Rock, Amber." Who is Amber? What's the oldest expression that you still use? Besides "Love You," of course. One of the most popular ones that we'll never lose is "Marry Me." We get requests for it all the time. Of course. People will write in saying, "I'm going to propose to my girlfriend and I want to cover the bed in Sweethearts. I need a bag of "Marry Me" hearts." And you'll just send them to people? Yes, and usually they don't ask for that many, so we don't charge them. I didn't even know you could do that. I'm going to start asking companies for free stuff. Last year, we changed all of the Sweetheart flavors. People seemed to love our new blue raspberry hearts, and they kept asking us for extras. Like, "Hey, I didn't have enough blue in my bag." So we'd send them some blue ones. I mean, why not? Watch TIME's video about dating advice. See TIME's archive featuring the best of Valentine's Day.